Click to Book Your Fun Now! At our events, our wedding DJ’s job is to make sure that your guests are getting up out of their seats getting down on the dance floor!! Your wedding should be one of the best memories of your life. Get Up to Get Down is experienced in making that memory a lifetime favorite. Choose a wedding DJ professional. Our secret to success is in the “details” of your wedding. We meet with our couples on two different occasions. One, this allows us to get to know the two of you. Two, we will go over wedding etiquette, song choices, agenda, and Up-Lighting colors etc. Three, we will collaborate on your timeline or the flow of your day. Have a question? Go to our Booking and Inquiry Page. As a videographer in the community for over 10 years, Get Up to Get Down has taken wedding videography to another level. We are there from the very beginning to the very end. 2 videographers will capture the most important moments from different perspectives, to come up with the very best recording of a very important day. 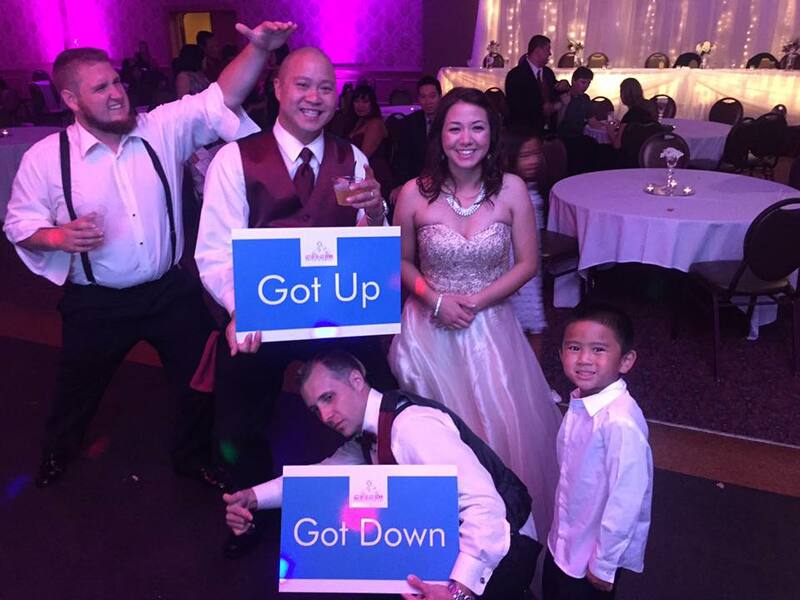 The Top 5 Reasons Why to Choose Get Up to Get Down Videography. 1. We will provide a cinematic story approach to your video. We want to tell your story. 2. We shoot from as many angles as we can for the perfect perspective. 3. We travel to your hairstylist/make-up session to capture these important moments. 4. We utilize high tech microphones and video cameras for a crisp look and professional sound. 5. We edit your video for you with professional video production software so that the final product looks and feels ready for the theater. Grab a bag of popcorn, sit back, and enjoy! Ask us about our Green Screen Video Guestbook. An excellent enhancement for any party. Be the life of the party and really "WOW" your guests. We offer digital and 4 X 6 Prints for your guests. Our photo booths come with a one of a kind LED inflatable walk in booth that can fit up to 15 guests inside. When you use our fun props it truly does become an memorable experience. Call us today for a FREE Quote. Your Top Choice for School Dance and High School Reunion DJ's. Disc Jockeys for school dances, Private Parties, and Special Events. Have the party that everyone will want to attend. Our Fort Wayne, IN area Disc Jockeys specialize in bringing your school the best in professional DJ's, premium lighting, and concert quality sound for your next school dance. Whether you are looking for a homecoming dance, semi-formal, prom, or even your high school reunion, our DJ's are experts in moving the party to the next level. An Experience that WOWS! Work Hard - Play Hard is our motto when it comes to businesses that want to plan their party the right way. We describe our Fort Wayne, IN area, Corporate Event DJ's as professional, playful, and fun. Our DJ’s are professional at the right times, and playful when you and your employees want to let loose. Give them the party that they deserve! Call us today to book your next event with our photo booth or DJ. Call us today to book our DJ’s and Photo Booth at your next event. Please tell us what type of event you would like to book us for.